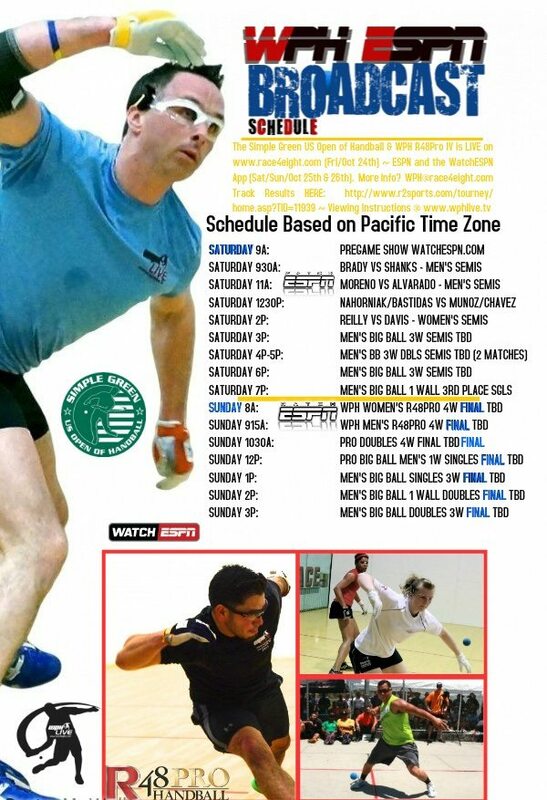 Friday at the Simple Green U.S. Open featured quarterfinal action in the men’s pro 4-Wall singles, as well as the start of the Women’s Race 4 Eight season and men’s and women’s 1-Wall and 3-Wall big ball. WPH R48 #1 Luis Moreno kicked off the men’s quarterfinals against his Irish rival Diarmaid Nash. Moreno started quickly in the third meeting between the pair in 12 months, building a 9-0 lead. Nash asserted himself, scoring seven consecutive points to establish himself in the match. Moreno regained the momentum with power hops during the rally, ultimately earning a one game lead, 21-16. Game two was one-way traffic, as Moreno built a 19-0 lead and advanced with a comfortable 21-16, 21-1 victory. Southern California neighbors Naty Alvarado and Mando Ortiz faced one another in the second men’s semifinal. Ortiz led 11-3 and 14-5 before Alvarado rallied, pulling within two at 18-20. Alvarado’s comeback stalled at 18, as Ortiz clinched game one, 21-18. Ortiz built a seemingly insurmountable 18-12 lead in the second and stood just three points from the semifinals. Alvarado turned the tables, holding Ortiz scoreless for the remainder of the game and forcing the tiebreaker with a 21-18 win. Ortiz ended his 32-minute scoreless drought by scoring the first three points of the tiebreaker, but Alvarado seized the momentum and never looked back once he entered the service box. Alvarado scored 11 of the next 13 points with a flurry of ace serves, incredible retrieves, and bottom-brick rollouts to secure an incredible, 18-21, 21-18, 11-5. Alvarado will face his rival Luis Moreno in tomorrow’s semifinal. Current world and national champion Paul Brady faced R48 I Elite 8 Luis Cordova in the third men’s semifinal match of the day. Brady simply overwhelmed and overpowered Cordova, running the top 16 pro side-to-side and wearing out his younger counterpart within the match’s first 10 minutes. Brady cruised to a 21-8, 21-2, quarterfinal win in just 28 minutes. The final men’s quarterfinal match of the afternoon pitted longtime contemporaries Charly Shanks and Emmett Peixoto. Peixoto dominated the rivalry until 2012 before suffering four consecutive losses at the hands of the former R48 #1. 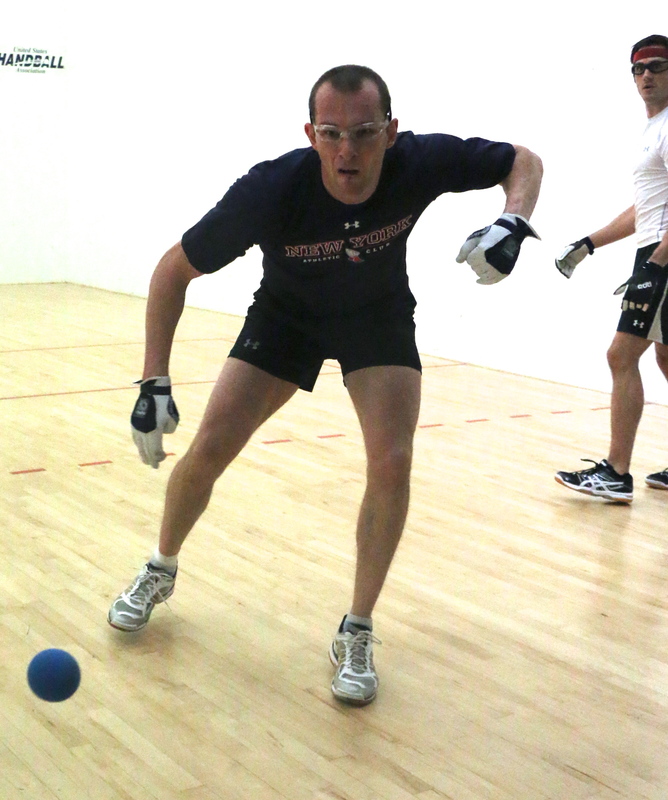 Peixoto ended his losing streak to Shanks at the 2014 USHA 4-Wall Nationals with a quarterfinal tiebreaker victory. Peixoto started the fourth quarterfinal on fire, moving effortlessly and driving the ball with conviction with both hands. Peixoto led 19-5 when Shanks took an injury timeout for what appeared to be a groin injury. Appearing to be in extreme discomfort during the injury timeout, Shanks was seemingly on the verge on forfeiting the match. Shanks regrouped and managed to build momentum late in game one, scoring five of the next seven points to lose 21-10. Shanks grooved his serve in game two, firing bullets down the right side wall that were either aces or yielding huge first-strike kill opportunities. Shanks held off a late Peixoto rally to force the tiebreaker, 21-15. Shanks’ serve proved to be the difference maker in the tiebreaker, as the former R48 #1 built a 9-3 lead on four aces and four first-strike kills. Peixoto would rally, scoring three consecutive points but a costly left-handed error handed Shanks the serve. Shanks quickly scored the final two points to secure a semifinal matchup with his countryman, Paul Brady. Top seeded Catriona Casey cruised against New York’s Shirley Chen to continue her undefeated Women’s Race 4 Eight campaign. Courtney Peixoto de Melo reemerged on the women’s pro handball scene with an emphatic first round victory to setup a clash with longtime rival Jessica Gawley. CPM looked dominant in game one, blasting serves and corner kills to trounce Gawley in the opening frame. Gawley relied on her unparalleled fitness to climb back into the match, extending rallies and capitalizing on a fatiguing CPM to force a third game. Despite a string of close losses in the last year, Gawley grabbed a tiebreaker lead and would not relinquish that lead, overcoming CPM and ending her Women’s Race 4 Eight debut in a thrilling 11-8 tiebreaker. The women’s bottom bracket featured Aisling Reilly cruising past Ashley Moler to advance to the semifinal. Third seeded Tracy Davis faced her protégé and 1-Wall big ball doubles partner Danielle Daskalakis. Davis raced to a 13-0 game one lead playing some of her most inspired and high-level handball, ultimately clinching game one 21-8. Daskalakis surged to an 8-1 second game lead with incredible serve-and-shoot handball and held off a late rally from Davis, forcing a tiebreaker, 21-18. In the most exciting conclusion to any match in the event, Davis and Daskalakis traded the lead seven times before reaching a 9-9 all tie. Davis proved why she is one of the greatest champions in the history of handball, summoning her most clutch play to score the final two points and advance, 11-9. Tune in tomorrow to watch all of the exiting indoor and outdoor action live on ESPN3 by going to http://espn.go.com/watchespn/.